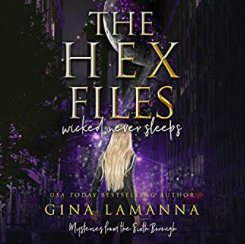 I borrowed an audio copy of Gina Lamanna‘s The Hex File: Wicked Never Sleeps through Hoopla. This was…well, sorry, but this was just not very good. It read problematically like the second book in a series and the lack of a first book was VERY felt. The plot was all over the place. There were inconsistencies. The dialogue was too formal and often awkward. It swerved into the ridiculous on occasion. There is no romance (when you sense there’s meant to be). Danni was supposed to be all tough and capable, but instead she seemed like a kid playing detective and you definitely felt that she was being coddled by the men. And in the end she didn’t even solve the case. The villain just randomly showed up and spewed the plan all over her. The “Hex Files,” important enough to name the series after, play no role and the reader finishes the book not knowing what they are. And there are hints of a possible future love triangle. All in all, I didn’t much enjoy this. I also didn’t care for the narration. But I don’t know if this is a failure on Ryan’s part or if she did the best with the material provided her. This entry was posted in books/book review and tagged audio book, book review, urban fantasy on February 2, 2019 by Sadie.